Voters in many areas of the North braved the worsening air pollution and came out to cast their votes. 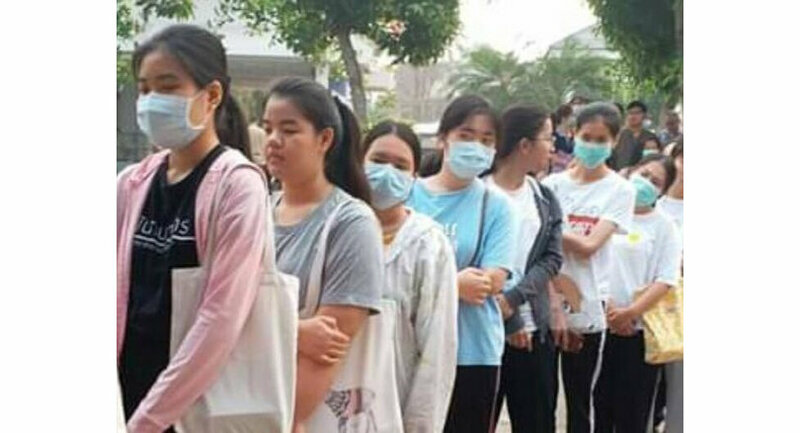 Many people showed up at their polling stations in Chiang Mai and Lamphun provinces wearing face masks to protect themselves from fine dust in their air. Provinces in the North have seen a sharp increase in fine particulate matter, PM2.5, blamed mostly on widespread burning of fields ahead of the next farming season. Voters sporting face masks were asked to remove them temporarily to identify themselves at their polling station. Lamphun Governor Attasit Samphanrat, who was seen wearing a face mask, advised voters – especially those with health problems – to protect themselves from the pollution. He also called on eligible voters to turn out in great numbers to help retain Lamphun’s record of having the highest voter turnout in the country. In July 2011, Thailand’s last general election, Lamphun boasted a voter turnout of 88.6 per cent. In Chiang Mai, people of all ages, including those suffering from illnesses, wore protective masks and came out to vote. Any bets who will be the next pm and what he/she will do about the appalling air condition in Chiang Mai province. Doesn't matter who's in charge. Nothing will be done about the burning. But are those masks shown the very same that has been pointed out as useless against Pm2. 5? Yeah, they are pointless against this type of pollution. Surgical masks like shown in the picture are essentially to stop the wearer from infecting anyone else...like a surgeon infecting a patient whose wound he is operating on. However, let's not let reality get in the way of looking dramatic in public. Even on the local news people were commenting that although voter turnout was high, many of them were not wearing masks. Apparently the Tesabahn gave out masks yesterday and guess what they were the useless surgical type! Yesterday I went to the pharmacy and got a dozen N95 masks and distributed them around the neighbourhood, to the people wearing the useless kind or none at all. Many of the older people simply don't realise how dangerous it is and how they should be protecting themselves.